This is perfect for an outdoor barbecue. 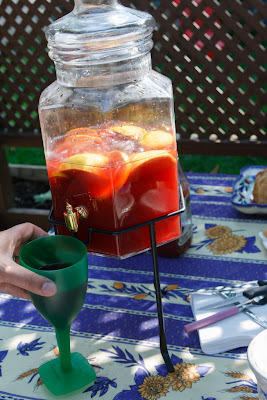 And it's particularly good for a big get together, as it makes a lot and isn't terribly expensive. My mom requests this almost every time she comes to visit. And only a glass or two of this gets her giggling like a little school girl. thanks for the awesome pitcher Brandi! 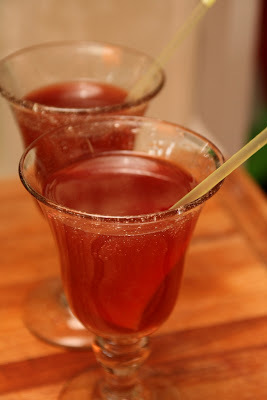 For the sodas, we used Fanta for the orange flavoured soda and sugar-free Fresca. We've used a variety of different things over the years, but tend to never use Sprite/7-Up or Orange Crush, as we find they don't give it quite the right flavour. This is super simple to make. You just mix together a bottle of wine, and about a half bottle of each of the two sodas. 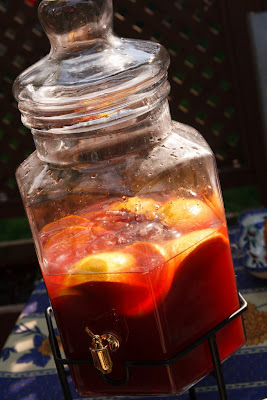 Then slice up the lemon, lime and orange and put them into the sangria. It is ideal if you can let this sit for a couple of hours before serving, to let the flavours mix. And let sit for a couple of hours. If not, just stir it for a bit to get rid of the carbonation in the sodas. Serve cold with extra ice.